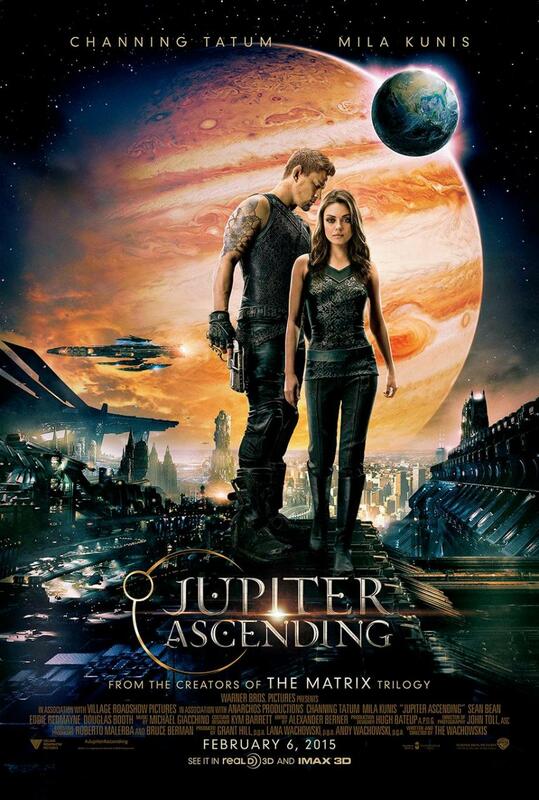 “Jupiter Ascending” was the name of my punk band in the ‘70s and also the latest feature film by The Wachowskis (“Cloud Atlas”). Leave it to them to bring lasers and light speed to the Cinderella story. Jupiter Jones (Mila Kunis from “Third Person“) is stuck in Chicago cleaning toilets every day. She looks up at the stars and dreams of another life and hates the one she has now. Enter her very furry godmother Caine (Channing Tatum from “Foxcatcher“), a part human, part wolf gene-spliced bounty hunter. It seems Jupiter is a genetic match to royalty in his world, and he was hired to bring her back to his planet to take her place on the throne. That’s right – sitting on a throne instead of cleaning one. Unfortunately, another bunch of bad alien types descend on the Windy City and try to kill her before she ascends. This lot came straight from the set of “The Fifth Element,” but they are no match for the magic boot flying of Caine. Did I mention this was in 3D? Eventually they get off the planet and the galaxy gallivant goes awry. Jupiter finds out that Earth is “just a small part of a very large industry,” and she is now part of the corporate family elite. By this time she has been part of several high tech battle and chase scenes that make “Star Wars” look like those “Dukes of Hazard” commercials. I know it sounds like I got carried away here, but I really enjoyed the ride. This may be the last time any studio will follow the Wachowskis down the rabbit hole with a budget like this and the latitude to create such a spectacle. These two walk the beat of a drummer more different than that kid in “Whiplash.” It’s tough to create a brave new world and expand your thinking beyond the rest of the comic book movies. This movie is not grounded at all, as gravity is optional along with an array of convenient characters and plot devices. There is a sweet story at the epicenter of the epically ambitious movie. This Cinderella fish-out-of-water and her lone wolf protector square off against their destiny to fight the galactic ruling class. It’s easy to throw photon torpedoes at a movie like this when it strikes out on its own hero’s journey. You will roll your eyes in a few places behind your 3D glasses, but it’s still cool that someone is not stuck milking the old brands and boldly goes over the moon where no cow has gone before. For that I must give this movie 3 ½ stars out of 5. People hated “Dune” when it came out and this is much better than that.